For many collectors, both novice and experienced, determining the value of antique milk glass is often confusing and difficult. Snuff bottles from China from approximately 140 B.C. Naturally, milk glass pieces from these very early times are not those collected by the average glass collector. Milk glass pieces dating from the mid 1800s through the beginning of the 1900s are highly sought after by collectors and are generally considered the most valuable, as are the pieces made during the second World War. 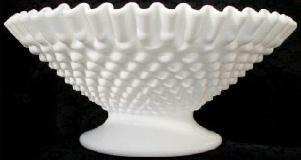 However, all milk glass made during the early to mid twentieth century are popular collectible antiques. Composition - Milk glass is made of a mixture of fifty percent silica, or sand, and various alkaline solvents, chemical compounds and minerals. In newer pieces, potash was typically used. In older pieces bone ash and arsenic were commonly used giving the pieces a gorgeous off-white color. Look - Older pieces usually have a opalescence that seems to have a shimmering effect caused by the ingredients used at the time. Mold - Older pieces typically have mold lines that are defined and sharp. There are many antique reproductions and replications of antique and vintage milk glass pieces. Many of these pieces look like genuine antiques. Some are made using original molds, and are perfectly beautiful replicas of the originals. However, be aware that there are unscrupulous people that try to pass new replicas off as original antiques. If you are new to the world of collecting antique milk glass, take the time to educate yourself as to how to properly identify original pieces of milk glass.